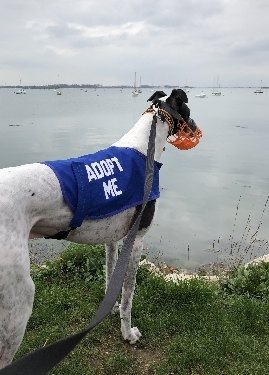 Greyhound Lifeline > News > Sea Boy Orca! 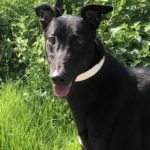 Orca is one of the greyhounds in Greyhound Lifeline’s care and he is still looking for an adoptive home. 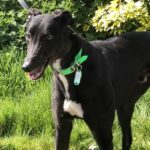 He is 5 years old and currently lives with his human foster family and several other greyhounds. Our foster greyhounds are lucky enough to take part in family outings, today it was Orca’s turn to visit the sea. Here follows is a shortened version of Orca’s interpretation of his very unusual outing, the full story can be found by following this link. ‘I wondered where I was going as all the normal turnings that the family make on trips had long passed and it seemed this journey went on for ever and ever. We eventually stopped at a very strange place. It was a marina, that’s where we were. We were right in the hub of it when we first stopped there and there were lots of strangers passing by. I was surrounded by huge monstrosities with big poles standing on them and the poles has noisy string like things that flapped and “sang” in the breeze attached to them. Marie said that the monstrosities were called yachts and the noisy, stringy bits she called rigging. I did lots of watching of things and sniffing the air type stuff. Things walked past, ran past, rode past, sailed past and flew past too, but all these things were at a nice, not too close distance so I very much enjoyed myself. Tom saved me a piece of cod too and poked it through my muzzle as a treat. It was very yummy. I went on a boat, a motor boat, not a yacht with all those scary, noisy, sky touching bits flapping about. Tom found me a soft bed to lay on, but I wasn’t ready for that yet. More things to look at, listen to and watch. I did stick to Marie’s leg rather, but I’m sure you understand that the experiences of this day were so unusual that I felt safer near her. Please note all volunteers (kennel hands included), visitors and customers must pre-book visits to our site which will involve bringing a non-resident dog on site. We are asking for at least 24 hours’ notice of your dog’s arrival, details of the day/time you wish to bring your dog(s) and how many dogs you propose to bring. We will endeavour to give you a suitable appointment time, but please appreciate that we can only be as flexible as our lease permits and you may be offered an alternative time/day instead. Email to enquiries@greyhoundlifeline.co.uk, by text or phone to 07828 138378 (Marie) or 07769 348310 (Lucy). The above pre-booking applies to visiting dogs only. Volunteers and customers without dogs joining them are welcome during opening hours as per normal. Viewings remain by appointment only as previously. 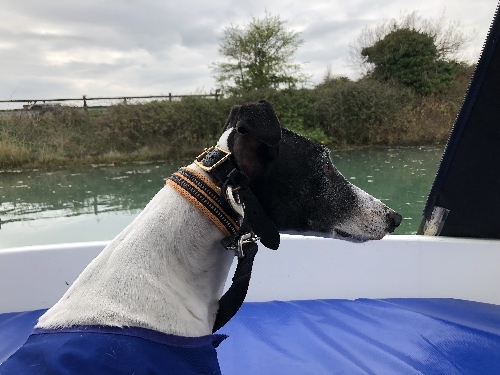 On Sunday 14th April Tricia, who adopted Connie from us, is running the Brighton Marathon in aid of Greyhound Lifeline. If you would like to sponsor her, pop into the kennels to fill out the sponsor form or email Greyhound Lifeline. Good luck Tricia and thank you! 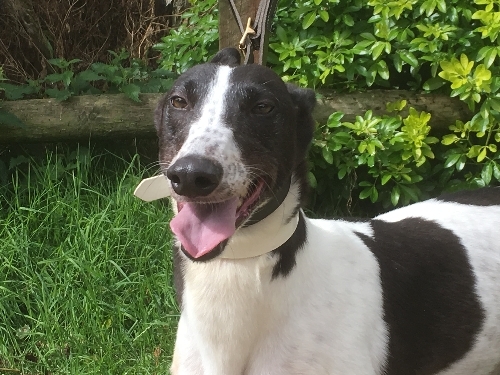 On Saturday 25th May Glenn, a supporter of Greyhound Lifeline, is completing a 25km walk as part of the Ultra Challenge Series. He will be doing the first quarter of the London to Brighton walk. Can you help Glenn raise his target of £500 for Greyhound Lifeline? Check out this link for more information. Thank you Glenn, for supporting our work. We are already busy planning this years Street Collections and events. Please put the below dates in your diary and we will update this page as we organise more. If you would like to meet this greyhounds or any of our resident greyhounds please call or email Greyhound Lifeline to arrange a viewing. All our home seeking greyhounds have updated their personal pages, please check them out and find the greyhound waiting for you! Thank you to our fundraisers who banked another £1000 for Greyhound Lifeline this week. They have raised this amount over the winter months through the sales of their jams, marmalades and cake sales. Car boot sales have now started for the year! If you can help by donating any unwanted gifts – un-opened smellies, perfume, childrens’ toys, games (board and electronic), DVD`s, jewellery and small electrical items including power tools, radios, computer accessories and watches are most wanted, we would be very grateful. 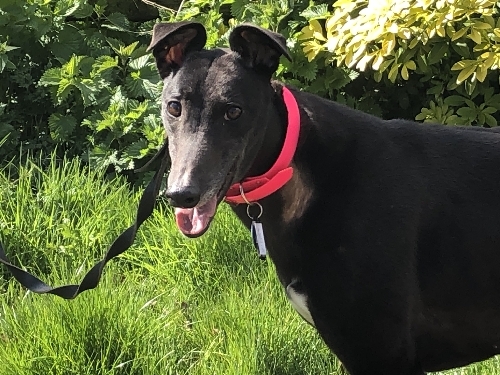 This entry was posted in News and tagged adopt a greyhound, fundraising events, greyhound adoption, greyhound rehoming, Greyhound Rescue, sea boy Orca by Lucy.